ColtUK - The Mitsubishi Colt Owners Club • View topic - Alloy wheels for my CJ - What to consider? Alloy wheels for my CJ - What to consider? Post subject: Alloy wheels for my CJ - What to consider? Your thinking about buying some alloy wheels for you Colt, but you need to know some information first. Hopefully this will help you to get the right alloys for your Colt. There are a few things you need to consider when looking at alloy wheels, these will normally be a series of numbers. But what do they mean? Hopefully this FAQ will help you along your way. Centre bore, PCD, offset and size of the alloy wheel. Most this of information is stamped on the inside of the alloy wheel. This is the size of the big hole in the middle of the wheel. The whole weight of the car and the associated driving stresses should pass through this bore on the end of the driveshaft. The PCD (Pitch Circle Diameter) is made up of two measurements. The higher amount is the measurement of the invisible diameter of the hub studs. The lower amount is the number of stud holes. If you donâ€™t get the correct PCD then the holes in the alloy will not match the hub studs. This is the distance in mm between the centreline of the wheel rim, and the line through the fixing face. This means that this measurement can either be positive or negative. With the incorrect offset it could mean the wheels will be too near the suspension or bodywork and that can cause rubbing under load. This can be overcome to an extent by body shops rolling or flaring the arches, but itâ€™s better if you donâ€™t rely on this. -For the CJ Colts Mitsubishi recommends an offset between positive 35-42mm, although up to 45mm has been used. This is the number most used when discussing alloy wheels. Most people talk about wheels ranging from 13 inches to 22 inches. It is the measurement of the diameter of the alloy wheel. -The CJ Colts can take alloys from 13 inches up to 17 inches, although 18 inch alloy have been known to fit. I highly recommend that no matter what alloys you are thinking of going for see if you can try them out first as itâ€™s better to be safe than sorry. Also remember to consider suspension modifications, tyre walls and size of brakes if upgraded. Post subject: Re: Alloy wheels for my CJ - What to consider? 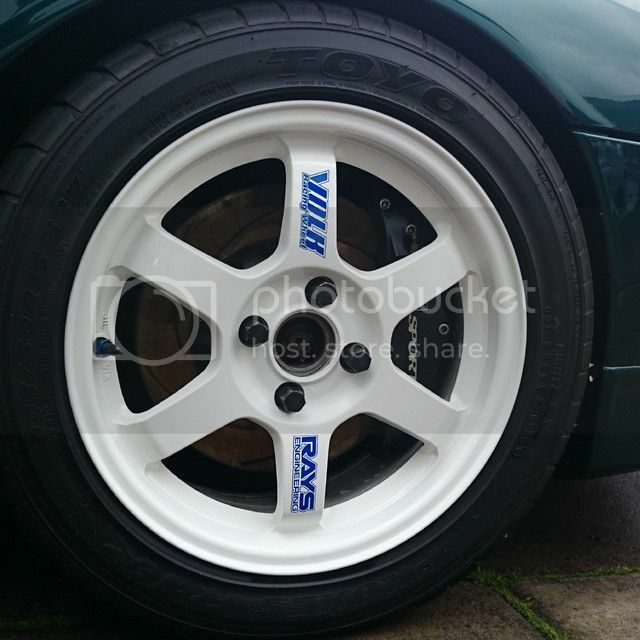 Now I'm on this things considering to buy a bigger wheel, because I'm not sure if a new front brake kit (evo3 calipers on clio sport 280mm discs) will take place in my 15" alloy wheels... Help needed. i believe 95% of 15" wheels WILL fit over the EVO3 brakes.. it'll just be a tight fit like 13" wheels over standard brakes!!! Maybe add something about spigot rings? My stock wheel size is 13x? with PCD 4x100. a higher offset means the wheel sits inside the arch more or comes out of the arch more? Either 13x5J or 14x5.5J, all of the stock wheels are et46.